After immersing myself in the Jenna Fox Chronicles, and reading what was one of my favorite series of all time, all I can say is "wow". I loved this series! I never expected to like it as much as I did, considering that there is a sci-fi element to the story, but I fell in love with the story and the characters and I'm sad to leave them behind. I've never read anything quite like this series before. The premise is so unique, and the thought that Locke and Kara's minds were trapped inside computers is hauntingly realistic and terrifying. It made me interested in the story from the very beginning and I just had to know what was going to happen once Locke and Kara got their bodies back. Book one, The Adoration of Jenna Fox, is told from Jenna's perspective, and books two and three are told from Locke's perspective. I didn't think I could like Locke's voice more than Jenna's, but I did. He was a very likable character, so steady and loyal. I loved watching him grow throughout the series. 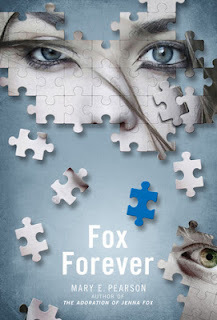 Fox Forever is the perfect ending to an awesome series. I love that the books span a long time period, which gives them a lot of depth and intensity. The ending was bittersweet, and Pearson managed to really surprise me with the epilogue. I love a good epilogue, and this one was perfect. So sweet and I loved getting a last glimpse of my favorite characters. I highly recommend this series to fans of dystopia, sci-fi and YA. It's excellent, and I can't wait to see what Mary Pearson comes up with next!